Finderscopes are of huge value to beginners in astronomy, looking for objects in the night sky can frustrate you at first. A finderscope normally rides on the back of the main telescope, but it looks much smaller in size. The purpose of a finderscope in astronomy is to aim the main telescope toward the object of interest. Because the finderscope offers a wide field of vision, you absorb more of the night sky than through the main telescope. 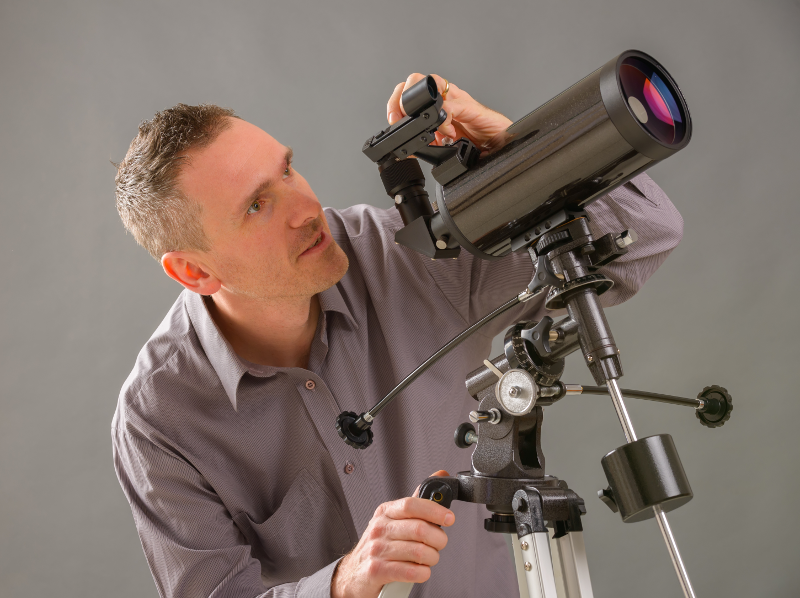 Once you identify an object with the finderscope, you look through the main telescope at a higher magnification to get a better look at the objects of interest. Orion presents you with three types of aiming devices: achromatic finder scopes, reflex sights, and bracketed green laser pointers. These three main categories of aiming devices also include different models with specialized features and functionality. While you could buy a single aiming tool, a lot of the novice astronomers incorporate multiple aiming devices on a single telescope to fall back on and spot objects with greater ease. Known as a reflex finder, the Telrad Finder Sight lets you spend more time looking at objects, rather than looking for objects. You can also use the Talrad Finder sight to complement another finderscope. This finder projects three separate concentric rings of four, two and half a degree on a transparent window. The greatest advantage of the Telrad Finder Sight is how even if you’re not on an object, you can see the direction you need to move the sight. The biggest con of the Talrad Finder Sight is how you can only use objects visible with the naked eye. Everything else will still be off limits and hard to spot. Beware, in damp locations, this telescope will be susceptible to dew. The Telrad makes deep sky objects and planets quicker and much easier to find. Anyone who wants a more hands-on approach to astronomy can benefit from this finderscope. You can watch tutorials on Youtube if you encounter problems, and you can download the Telrad sky maps as an extra tool for the first-time astronomer. A simple and more affordable option for telescopes, the Red-dot Star Pointer Finderscope eases the aim of your telescope to make for excellent adjustment. You can align the small red LED dot to project it to a non-magnifying view that includes the bracket fit or bigger telescope optical tubes. The only exception to this is the Schmidt-Cassegrain telescope optical tubes. Manufacturers made the main part of this finderscope from plastic, but the product still points your telescope in the right direction. For the best results, line the telescope up during the day to a distant object like a chimney post. The only real complaint you might have about this telescope is how the mounting screw holes do not match with the C8 OTA, but that does not harm the function. When you weigh the benefits like the finderscope being lighter than the Telrad, it might be an even better choice. Featuring an illuminated dual cross-hair reticle, you can center the telescope on your target object easier than ever before. You also have a fully corrected image for easy use intuitively. Rotate the eyepiece assembly to the left and the right to discover the most comfortable viewing angle. Because of the image corrector, the diagonal offers simplicity of use, and if you have spatial relations problems, such as seeing the object upside down, you can use the scope to view it right-side up. The Celestron RACI Illuminated Finderscope adjusts the reticle to low light and becomes an asset. While this finderscope has been flawlessly designed, the product lacks instructions. For the price paid, this finder scope should come with instructions, but you cannot even find a guide on the Celestron website. When using this finderscope, it features a red dot, but the dot blots out almost everything it comes into contact with. You can, however, use the red dot as the preliminary to get a closer viewing and tune the finderscope to sighting. The mounting takes place in a tight and secure manner, and the screws adjust at the mid-range level to eliminate looseness. Sometimes beginner telescopes will have a finderscope included. A bigger one, however, turns a search of the night sky into a much easier experience. Beware of some finderscopes. Alignment frustrates even the more seasoned beginners, and you may find it difficult when looking through it, which defeats the purpose. In general, first timers will want to twist the adjustment screws of the finderscope during the day. Trying to figure out unfamiliar knobs and settings will only exasperate the problem. For beginners, finderscopes take the guesswork out of star gazing and offer a pleasurable learning opportunity where you discover the mysteries of the cosmos.